Last view: 1225 days ago I'm starting to reverse engineer the DSP protocol, which games use to communicate with the signed binary running in the DSP. This is interesting to explore a possible HLE implementation in Citra, but more importantly, should hopefully open the way for better and more reliable sound in homebrew. At least initially I plan to do mostly black-box RE, by taking traces of DSP communication with Citra and trying to decode those and apply them to hardware. Right now I'm examining Bravely Default, but from my analysis of a bunch of DSP bins, they have few differences so this should apply to most games. Hopefully I'll use this thread as a log/dump for any info I discover. - WriteProcessPipe: 0000 160C, first number is unknown, second is garbage read from the stack and as such tends to differ from game to game. 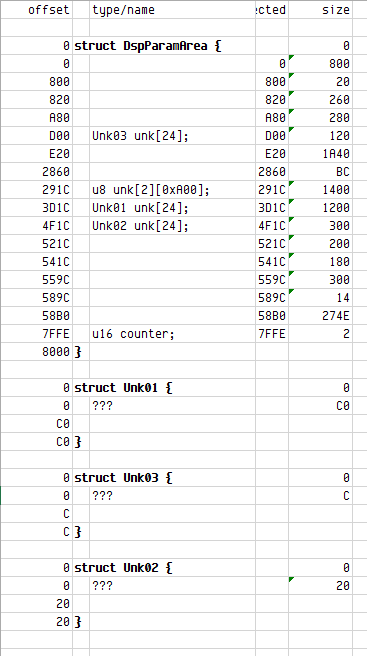 - ReadPipeIfPossible: N u16 DSP addresses are read here, which point to the location of various control variables within DSP memory. After reading these are passed through ConvertProcessAddressFromDspRam to convert them to ARM11 userspace addesses. An additional copy of these variables is present with offset 0x10000 (in DSP words). From here on, when I say "7FFE" for example, I'm referring to the mirror variables at 0x1FF57FFE and 0x1FF77FFE. From here on communication with the DSP is done by directly writing/reading to the DSP RAM areas mapped in the process at 0x1FF5000 and 0x1FF70000. The two areas (each size 0x8000) are used alternately, and at the end an incrementing counter is written to 7FFE. This indicates that a double-buffering scheme is used where the game writes the data to the variables and then increases the counter to let the DSP know to process the new page. The page switch seems to happen once per audio frame (probably around ~4.88ms). My current goal is to figure out how the address of the sound buffers which are cache-flushed are passed to the DSP. MySQL - queries: 28, rows: 67/67, time: 0.012 seconds.